Despite suffering his first career defeat at the hands of Omaha Beach this past weekend, reigning juvenile male champion Game Winner still retained the No. 1 spot on the National Thoroughbred Racing Association (NTRA) Top 3-Year-Old Poll this week. 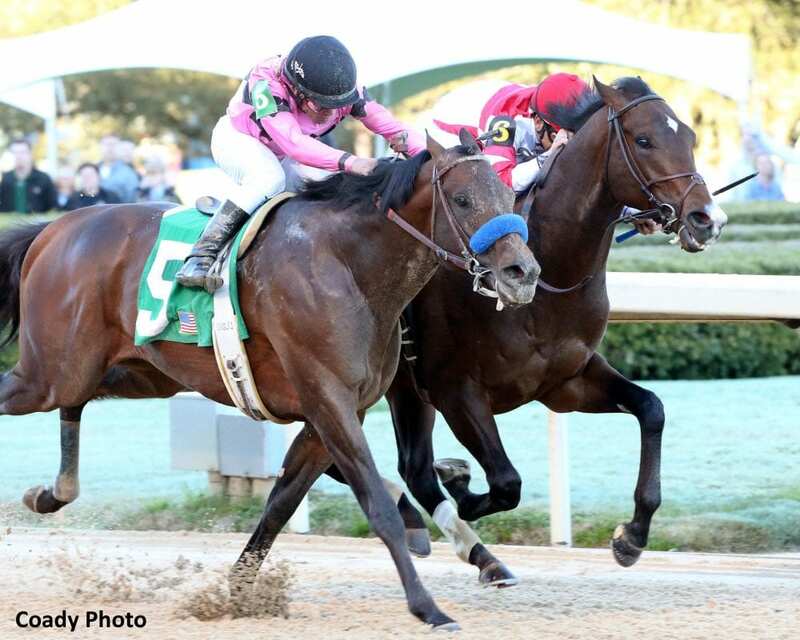 In his first start since capturing the Sentient Jet Breeders' Cup Juvenile last November 2, Game Winner fell a nose short of Omaha Beach in the second division of the Grade 2 Rebel Stakes held at Oaklawn Park March 16. That loss did little to take the shine off the Bob Baffert trainee as Game Winner still earned 16 first-place votes and 342 points to hold top poll honors. War of Will, the expected favorite for Saturday's Grade 2 Twinspires.com Louisiana Derby, garnered 14 first-place votes and 336 points to hold second place in the poll. Improbable, who was beaten by Long Range Toddy in the first division of the Rebel, sits third with five first-place votes and 277 points followed by Code of Honor (3 first-place votes, 259 points) and the upstart Omaha Beach (253 points). The latter was previously unranked. Pegasus World Cup Turf Invitational winner Bricks and Mortar (2 first-place votes, 251 points) is fourth with Grade 1 winner McKinzie (1 first-place vote, 187 points) fifth. Midnight Bisou (176 points) joins the top 10 in sixth off the strength of her victory in the Grade 2 Azeri Stakes followed by Seeking the Soul (143) and champion turf female Sistercharlie (121). Marley's Freedom and Accelerate tied for ninth with 72 points apiece. The NTRA Top Thoroughbred polls are the sport's most comprehensive surveys of experts. Every week eligible journalists and broadcasters cast votes for their top 10 horses, with points awarded on a 10-9-8-7-6-5-4-3-2-1 basis. All horses that have raced in the U.S., are in training in the U.S., or are known to be pointing to a major event in the U.S. are eligible for the NTRA Top Thoroughbred Poll. The NTRA Top Thoroughbred Poll concludes November 4 after the running of the Breeders' Cup. This entry was posted in NL List, Triple Crown and tagged Code of Honor, game winner, improbable, long range toddy, mucho gusto, National Thoroughbred Racing Association, NTRA, ntra top 3-year-old poll, Oaklawn, oaklawn park, omaha beach, rebel, Rebel Stakes, tacitus, war of will by NTRA. Bookmark the permalink.